and the diverse contexts of his art. From Emory University’s Networking the New American Poetry project. www.jackkerouac.com is an ever-evolving interactive storehouse and exhibition space dedicated to Jack Kerouac and connected topics. The site is dedicated not only to Kerouac, the author, but also to the cultural and social history that swirls around him. www.jackkerouac.com is produced and edited in Kerouac’s hometown of Lowell, Massachusetts (at the University of Massachusetts Lowell by the Jack and Stella Kerouac Center for the Public Humanities), and the site takes special care to focus on Jack’s connections to Lowell. Yet, even as the local is one important focus, the site also emphasizes Kerouac as a global author, at once the product of French-Canadian heritage and of worldwide aesthetic and social influence. 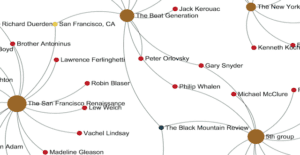 The Jack Kerouac Estate has granted permissions and provided considerable support for jackkerouac.com. This site was constructed with financial support from the University of Massachusetts President’s Office Creative Economy Fund and a Mass Humanities Exhibit Planning Grant, as well as the UMass Lowell English Department, the American Studies Program, and the Center for Arts and Ideas at UMass Lowell. We also wish to thank the Lowell Cultural Council and the Massachusetts Cultural Council for financial assistance with the “Lowell Rocks Warhol” event in October 2014. Copyrights and ownership: Various images, audio recordings, and other material on jackkerouac.com are used by permission of their owners and copyright holders. The likeness of Jack Kerouac and the url www.jackkerouac.com are used by permission of the Jack Kerouac Estate. Please respect this ownership and copyright. All projects are owned by their authors. Owners and copyright holders are indicated on pages, in captions, and in the metadata.